This was just one move. Black stood and waited for Hollis to approach him, then hit him with his finisher. Match ends. The kick looked pretty good though, so there’s that. Kayla Braxton congratulates Tye Dillinger on his move to SmackDown. Dillinger says he has some unfinished business before he says goodbye to NXT, so next week he’ll face Eric Young in a steel cage. This was actually pretty interesting. Dylan Miley started for his team, and being a huge guy, he dominated DIY. Pretty much completely. Blais, who is significantly smaller than Miley, wanted a tag while Gargano was reeling. So Blais comes in, and DIY quickly makes a comeback, double-teaming Blais and completely avoiding Miley. This was a clever way to make a squash not seem like a squash. After the match, Miley seems frustrated. He enters the ring and takes out his frustrations on his tag team partner. Miley repeatedly slams Blais before storming off. Ember Moon failed to defeat Asuka at Takeover. Then, in an empty arena after the event, Ember Moon laments the fact that she lost and failed to capture her moment. She seems upset that Asuka pushed the ref into the ropes near the end of their match. Moon vows to be the next NXT Women’s Champ. This was an okay match. Frankele had a little bit of offense, but this was mostly Riot’s match. Nikki Cross showed up at ringside early in the match, but she didn’t interfere. She just watched. Nothing really special about the match, but it was fine. A highlight package/promo for the Authors of Pain. Earlier today, Billie Kay and Peyton Royce walked through the WWE Performance Center. They walked past Kassius Ohno and Norman Smiley and encountered Aliyah and Liv Morgan. Morgan pushed Kay into one of the baths, and everyone seemed to have a good laugh. Except for Billie Kay. A good match and a great in-ring debut for McIntyre. The match wasn’t very long, but it was very hard-hitting. Both guys were throwing very strong-looking strikes, and Lorcan even got busted open towards the end of the match. McIntyre looked impressive, showing good power and strength (such as when he caught Lorcan on the floor from a top-rope dive and slammed him onto the apron). After the match, Dasha Fuentes asks McIntyre what brings him to NXT. 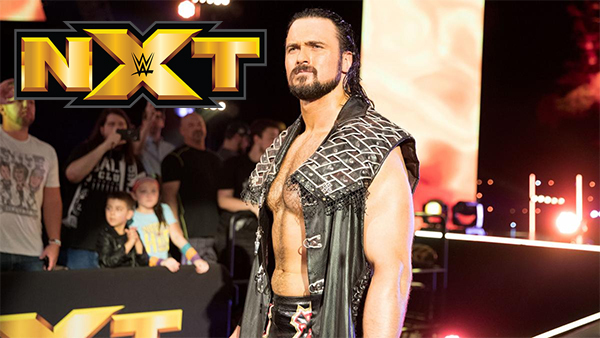 McIntyre says he’s worked hard over the last few years to build a reputation, and he doesn’t want to be anywhere except for NXT. Shinsuke Nakamura heads to the ring. He talks about his arrival in NXT a year ago and of the things he’s learned. One thing he’s learned is that the NXT Universe is crazy. Nakamura will always be NXT. As Nakamura gets applause from the crowd, the locker room clears and applauds from the stage. This was an okay show. The main event was good and the tag match was surprisingly entertaining. This feels a lot like a transitional show, so not much really happened as far as stories go, but I think this episode is setting some of the groundwork for things to come. Good match and a great debut. McIntyre definitely made a strong first impression.